“A Departure to Be Welcomed”: Robert Scheer on Resignation of White House Economic Adviser and Deregulation Proponent Lawrence Summers | Democracy Now! longtime journalist based in California. He is the editor of Truthdig and author of many books. His new book is The Great American Stickup: How Reagan Republicans and Clinton Democrats Enriched Wall Street While Mugging Main Street. AMY GOODMAN: The makeup of President Obama’s economic team is being shaken up some more as Lawrence Summers has announced he’s resigning as director of the National Economic Council later this year to return to Harvard University. He is the third top economic official to leave the administration in recent months. According to Bloomberg News, the White House is considering naming a “prominent corporate executive” to replace Summers in order to counter Wall Street criticism that the administration is “anti-business.” The Wall Street Journal reports former Xerox chief executive Anne Mulcahy has emerged as a leading candidate to replace Summers. During her time at Xerox, Mulcahy laid off 30 percent of the company’s workers. Mulcahy reportedly had dinner in Washington Friday evening with senior presidential adviser Valerie Jarrett. for more than three decades. His new book is called The Great American Stickup: How Reagan Republicans and Clinton Democrats Enriched Wall Street While Mugging Main Street. 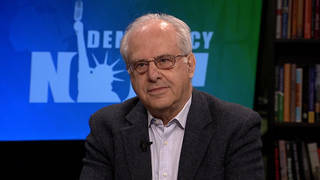 Bob, welcome back to Democracy Now! AMY GOODMAN: So, President Obama has lost three of his four top economic advisers. Only left is Timothy Geithner. ROBERT SCHEER: Well, I don’t think “lost” is the right word. I think “fired” is better. I think Summers — anyway, his departure is certainly to be welcome. My book is largely about the follies of Lawrence Summers, beginning in the Clinton administration, when he pushed through the Commodity Futures Modernization Act, which opened the floodgates to all of these toxic derivatives that he, as much as anyone in the country, bears responsibility for the economic debacle. And then Obama brought him back. And I think what he has done is basically throw money at Wall Street, continue the Bush policy, and get nothing in return, particularly in the way of relief for homeowners — you know, mortgage foreclosure, a moratorium on foreclosures. And so, I think this is really good news. And, you know, I hope he’s not replaced with someone worse, but it’s hard to imagine someone worse. AMY GOODMAN: You wrote a piece, among others, since you’ve written extensively about Larry Summers, Bob, called “Living Large and in Charge.” Give us the history of Larry Summers. ROBERT SCHEER: Well, every — you know, once again, the New York Times today, Barack Obama, President Obama yesterday, referred to this guy as “brilliant.” And I don’t know how many times you have to fail before you’re considered to be something less than brilliant. And this guy has been a disaster at every position he has held. He was the Treasury Secretary under Clinton who presided over the radical deregulation of that administration, fulfilling the fantasy of the Reagan Revolution. The Republicans couldn’t pull it off. Summers and Robert Rubin, his mentor, did pull it off. And it’s been — this is the basic root cause of this meltdown. Then he goes to Harvard, where he was a disaster as president, divisive, mysogynist, demeaning of women and so forth. And meanwhile, he’s being paid not only close to $600,000 by Harvard, but then he goes and consults on Wall Street. He was paid $4 million by D.E. Shaw, a hedge fund, and you’ll notice the Obama administration has not reined in hedge funds at all. And he received almost another $4 million in speaking fees. He got $135,000 from Goldman Sachs for one short speech. He got that much from Citigroup for two speeches. You know, so this guy, while he was advising Obama, he was raking it in, eight million bucks, while he’s an adviser to the candidate. And then, for reasons that Obama will someday have to explain, he’s brought in as the key guy. It’s not Geithner. Geithner is a water carrier and was very much a subordinate in the Clinton administration to both Summers and Rubin. And they bring in Summers, and what he did is, again, follow that strategy, reassure Wall Street, don’t spook the markets, give them what they want, submit to their blackmail, and make them whole. And they continued the Bush policy with a vengeance, throwing money at Wall Street. The Fed now holds $2 trillion worth of toxic assets taken off the books of the banks. The banks still hold a massive amount. And every time the housing market looks like it might get better, they dump this stuff. The Fed announced yesterday that the economy is not getting better. They’re very troubled. So what is the legacy? You know, it’s like Vietnam. Vietnam, as David Halberstam once wrote, was brought to us by the best and brightest, people who presumably have the best education and, you know, are sincere and smart and so forth. And the economic meltdown reminds one of that and Vietnam. I mean, if this is what brilliance means, let’s have a sort of ordinary common sense for a while. And common sense will tell you, help the homeowners now. You’ve done enough for the banks. Get something back from the banks. Make them, you know, readjust those mortgages. Don’t have it be voluntary. Empower the bankruptcy courts to help the people who are struggling, the 40 to 50 million people who are already underwater on their mortgages, but everybody else. And if you don’t do that, you’re not going to fix this economy. And I don’t care whether he brings in a businessman or a labor leader or brings in Stiglitz or makes Paul Krugman his adviser, whoever he brings in has got to tell him that, or we’re not going to see progress. AMY GOODMAN: Now, of course, it’s not just Lawrence Summers. He’s not in charge of the policy. Ultimately, President Obama is. What is his responsibility here? Why did he surround himself with, well, among others, Larry Summers? ROBERT SCHEER: Well, I’m not his shrink, you know. He mystifies me. I was very enthusiastic about the Obama candidacy. He gave an incredible speech in April of '08, laying out the source of our problem in the radical deregulation, saying we ignored the consumer, the ordinary worker and so forth, that he specifically criticized the priorities of the Clinton administration. But then again, he was running against Hillary Clinton. How you give that speech and then turn to one of the architects of Clinton's policy to run your own economy is beyond me. I have to stock it up to opportunism and maybe his own insecurity in trying to grasp economics. After all, these toxic packages were designed to be opaque. This whole — all these financial finagling devices and so forth were built by people who were supposed to be mathematical geniuses. When long-term capital management collapsed, there were two Nobel Prize winners on the board. You know, so these things are — can be very tricky. There’s a legion of lawyers and PR people and everything else to all make them seem very reasonable, and maybe Obama was intimidated. And he seems to also get a lot of advice from the University of Chicago economists, one of whom is rumored to be the key player in this administration, and those people have a very old-fashioned notion of the free market that really does not apply to corporate America. I mean, it might have applied to Adam Smith’s America, but corporate America is a political animal, and their lobbyists control Washington on anything that has to do with their interests. That’s why we got the radical deregulation. And you’ve got to bring somebody in who understands that if you don’t check the Wall Street lobbyists and you don’t check their power, you’re not going to serve the American people. I mean, that’s really what this is all about. And right now the tea party has seized the populist ground. They claim to be worried about the people who are hurting. We have a lot of people hurting in this country, a lot of people. We have the highest level — highest number of people in poverty. Forty-three million Americans are in poverty. And poverty is defined by a family of four living on less than $22,000 a year. Try living in America, family of four, under less than that. We have 43 million people in that, the highest number. We have the highest level of poverty among the able-bodied, of eighteen to sixty-five, that we’ve had since '94, thus wiping out all the claimed gains of the Clinton administration and everything that came after. You know, we have — we've lost $11 trillion of family income and worth. That was the latest report. We lost $1.3 trillion just in the second quarter alone. We have this enormous debt that’s going to prevent us from doing things in the future that have to be done in terms of improving our lives. And so, who’s addressing that? These tea party people. And the tea party people are frauds, in the main, because they won’t attack corporate power. They’re basically, you know, still singing the song of deregulation, keep government out of it. And the fact is that as long as Wall Street can use government for its purposes, you know, then you’ve got to address that problem. And we do not have a progressive political alternative at this time. And unfortunately, Russ Feingold, who’s like one of the few around, seems to be in trouble in Wisconsin. And if your listeners can do anything in this election, they should try to help him, because if we lose his voice, we really lose the conscience of the Senate. But there are very few voices on the progressive side of things. Obama had promised to be such a voice, but he’s now basically a silken glove for corporate power, unfortunately. Now maybe that will change. I’m always hopeful. And maybe the departure of Summers is the beginning of a new day in America. We’ll see. ROBERT SCHEER: Yeah, look, you know, I actually wrote a column saying that I wasn’t upset that Rand Paul won the Republican nomination in Kentucky, I wasn’t that upset that the tea party candidate won in Alaska, because both of them at least challenged the power of the Federal Reserve. At least both of them demanded an audit of the Federal Reserve. The Federal Reserve, you might recall, when Timothy Geithner was head of the New York Fed, that’s where they made those deals on the weekend where they decided to bail out AIG. And we still don’t know what happened then and how those deals were made. So, you know, there are some voices on the right that, to my mind, are reasonable and are making important points. And I think it would be fine to have a Rand Paul in the Senate. You know, yes, an honest Libertarian voice would be helpful. But they’re not going to solve the problems of this country, because this country is going to remain a mixed economy. And a mixed economy, to this day, it means basically a Wall Street-driven economy. I can’t stress that enough. Everybody thinks, well, you’re putting up a straw man or something. It’s nonsense. Two-thirds of the profit that was made in this country during the Bush years was made by the financial community. They were also the main backers of Obama’s campaign. I mean, you know, you can’t underestimate the power of Wall Street in our society at this time. And they can control our politics, certainly when it comes to anything they care about. And take the case of Elizabeth Warren, for example. I mean, here was a perfectly reasonable, highly educated woman who dared speak for the consumer. I mean, there’s nothing radical about Elizabeth Warren. All she’s saying is, “Hey, let’s look out for the people signing these contracts.” You know, she’s not even raising the prospect of controlling interest rates, which, by the way, used to be in not only the California state constitution, but quite a few in this country. It was preempted by federal legislation, which Wall Street sought, saying the states no longer have power to regulate the interest rate of any institution that has any kind of federal banking connection, which is just about all of them. So, you know, something that the Bible scripture calls for, whether you’re Hebraic, Christian or a Muslim tradition, usury is condemned. It’s condemned far more than anything else in the Bible. And yet, you know, if you dare suggest we not charge 35 percent interest to somebody on their credit card, my God, no, that can’t be. So Elizabeth Warren hasn’t even raised that issue of controlling interest rates. All she’s talking about is transparency, make sure the language is clear, make sure people understand, it’s in print that they can read when they sign a home mortgage, and so forth. And she’s considered too radical, and Obama chickened out totally. He should have taken the fight for Elizabeth Warren being head of this new agency, which is really the only important thing to come out of his financial regulation, was the creation of this agency. Unfortunately, it’s tucked away in the Federal Reserve, so, you know, that’s controlled by the banks. She will have to now report to the Treasury Department, because of the way now she’s an adviser. And he ducked that fight. And that was an important fight for him to have. And if the Senate wanted to turn this down, let’s find out why and let’s get the public involved. Do they want a vigorous consumer representative in there? And let me just say one point also about these so-called brilliant people and the problems we’re in and everything. On the first page in my book, I quote an exchange between George W. Bush and Henry Paulson. Paulson is another supposedly brilliant person. He was head of Goldman Sachs. George Bush brought him in as Treasury Secretary, one of those corporate people that they’re saying Obama might bring in and so forth. And Paulson at least had the honesty in his memoir, which I quote on my first page, where George W. Bush asked him, “How did this happen?” Here’s the President of the United States asking his new Treasury Secretary, former head of Goldman Sachs, “What is this we’re in, this economic meltdown? How did this happen?” And Paulson answers, “It was a tough question for somebody from the financial community to ask, because we were responsible.” However, when you read — and that’s an honest statement, a good one. However, when you read further in the book, Paulson admits he did not know these toxic mortgage derivative packages and credit default swaps were at the basis of these toxic securities. He did not understand at that time, as he was advising the president. He only found out later. So when these people present themselves as very knowledgeable and on top of things, most of the time they’re not. As long as the money is coming in, as long as the profits are increasing, as long as they’re getting, as Robert Rubin did, $15 million a year, or a Lawrence Summers can make $8 million just consulting and speaking for Wall Street, they don’t want to look a gift horse in the mouth, and they’ll go along. And they don’t really care whether it explodes after they’ve gotten theirs and hurts the rest of us. AMY GOODMAN: Robert Scheer, thanks so much for coming in. His book is just out in paperback; it’s called The Great American Stickup: How Reagan Republicans and Clinton Democrats Enriched Wall Street While Mugging Main Street. Was a reporter with the Los Angeles Times, a columnist for more than thirty years, and is the editor-in-chief of Truthdig.com. This is Democracy Now!, democracynow.org, the War and Peace Report. We’re sticking on economics, barefoot economics, when we come back. We’ll speak with a Chilean economist about what’s happening in the United States. Stay with us.